Albertans who want to see the Trans Mountain pipeline built can take away some positive news from a new poll Wednesday, but they should also heed a warning. Shutting off the oil taps to British Columbia could backfire. Public opinion in Canada — even in B.C. — has moved into majority territory supporting Kinder Morgan’s expansion of its Trans Mountain pipeline, according to a poll by the Angus Reid Institute. The poll of 2,125 Canadians released Wednesday shows 55 per cent now back the pipeline project, up six percentage points since February. About one in four Canadians are opposed. The rest are unsure. On the other side of the Rocky Mountains, where the debate is most intense, 54 per cent of British Columbians favour the development. Even on Vancouver Island and in metro Vancouver, a hotbed of pipeline opposition, a slender majority of respondents support the venture, according to the online poll conducted earlier this week. “We are starting to see a hardening, a shifting in support that ticks towards … completion of this pipeline,” said institute executive director Shachi Kurl. 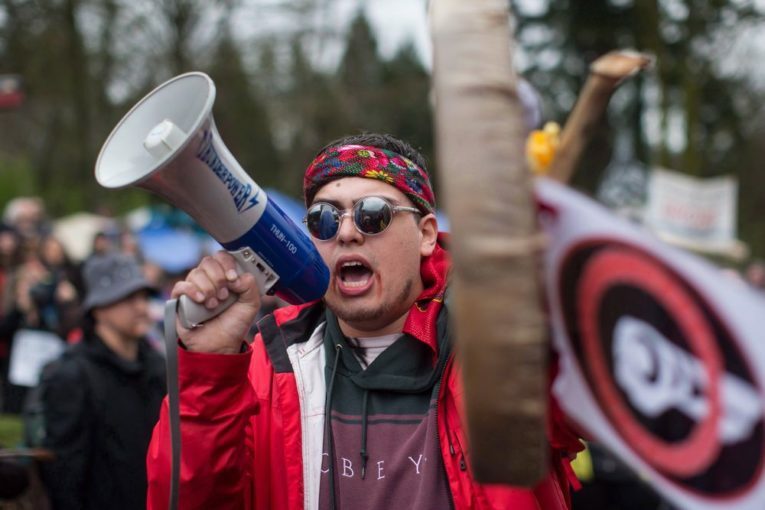 The Trans Mountain pipeline, which transports oil and refined petroleum products from Alberta to the Pacific coast, has become a flashpoint for an intense national political debate in recent weeks. Despite daily protests against the project, it’s worth pointing out more people in every region of the country — including Quebec and Ontario — back the project than oppose it. In Alberta, eight in 10 support the pipeline. This gives Premier Rachel Notley a lot of political room in her fight with the B.C. government, which is attempting to foil the development. “We’ve always known there’s a lot of support. I think the supporters are becoming more vocal,” Energy Minister Marg McCuaig-Boyd told reporters at the legislature. Her comments came the same day the government of B.C. Premier John Horgan announced it will send a reference question to that province’s Court of Appeal by the end of the month. His government is trying to determine if it can legally restrict bitumen shipments into the province. The case may be up in the air, but Horgan is clearly losing ground in the court of public opinion. Almost two-thirds of Canadians say B.C. is wrong in its attempts to derail the federally approved pipeline. “Having the discussion we’ve had over the last two weeks has been very positive,” said Tim McMillan, head of the Canadian Association of Petroleum Producers. But before supporters start preparing for a victory parade, there are some other hard truths to consider. Most Canadians — 56 per cent — think it’s a bad idea for the federal and Notley government to become investors in the Trans Mountain project. Kinder Morgan announced last week it would suspend all discretionary spending on the $7.4-billion venture until it receives more certainty on being able to complete construction. Prime Minister Justin Trudeau said Sunday he would begin talks with Alberta and Kinder Morgan about taking financial steps to de-risk the venture from further delay. On Wednesday, Kinder Morgan CEO Steve Kean wouldn’t discuss the state of negotiations, but confirmed they have commenced. Notley has talked about acquiring a stake in the pipeline to get it built, even buying it outright. In Alberta, the investment idea draws a mixed response: 52 per cent think it’s a good use of taxpayer money, but 48 per cent are against it. Political efforts to strong-arm British Columbians, such as Alberta’s new Bill 12 that would let the province restrict exports of crude oil and products to spike gasoline prices in the Lower Mainland, appear to be less effective in winning over opponents, Kurl said. She noted a majority of B.C. residents are concerned about the potential risks of a spill due to increased oil tanker traffic tied to tripling the pipeline’s capacity. So what line should Alberta take in the weeks ahead? Across Canada, 63 per cent believe a soft approach is needed with incentives and compromises to encourage B.C. to relent. Only 37 per cent — but 74 per cent in Alberta — back a “hard line” approach. When asked what the Horgan government should do if Alberta throttles back oil exports, 53 per cent of B.C. respondents said the province should back down, but 47 per cent say it should stand firm against it. However, if the courts rule B.C. doesn’t have the authority to block a pipeline — and this one is clearly under federal jurisdiction — 69 per cent of British Columbians say their government should give up. With public sentiment moving in favour of building Trans Mountain, it makes sense for Notley to stick to her current strategy and not turn down the oil taps, said political scientist David Moscrop at Simon Fraser University. “Why would you use the stick? There’s no reason to do it, but there’s plenty of reason to have it, because it makes you look tough,” he said. Finally, as the Trans Mountain fight continues, it appears the economic message is sinking in about the need for more pipeline capacity in Canada. Two in three Canadians believe building the pipeline would help the Alberta economy, while 59 per cent say it’d help the country’s economy. And three-quarters of Canadians believe the pipeline will likely be built. The donnybrook over the need to build energy infrastructure in the country has become messy and divisive. But slowly, it appears a national consensus is forming: get the Trans Mountain project built.